Tickets will be offered one hour before the screening at the Phi Centre box office. First come, first serve basis (maximum 4 tickets per person). Asphalt Watches is a true story. 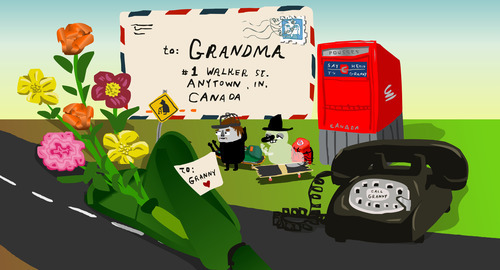 A feature-length animation based on a real-life hitchhiking trip taken by the two filmmakers, Shayne Ehman and Seth Scriver, Asphalt Watches details the hilarious and harrowing journey of Bucktooth Cloud and Skeleton Hat as they travel eastward across Canada in the summer of 2000.